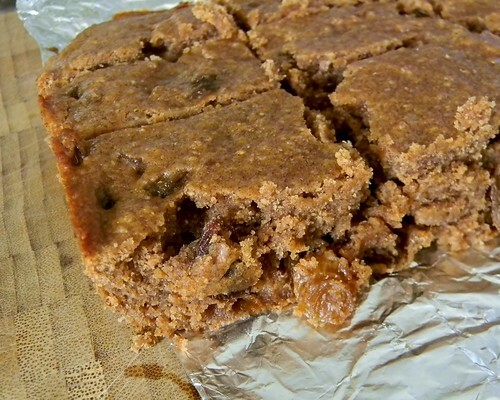 Cinnamon Raisin Blondies #CreativeCookieExchange | What Smells So Good? Heat oven to 350F and line an 8” square pan with parchment paper. Whisk together the butter, cinnamon, honey and brown sugar in a large bowl. Add egg, yoghurt, vanilla and salt, blending well. Add the flours, baking powder and maca powder, blending to incorporate well. Fold in the raisins (along with any leftover boozy liquid). Scrape into the pan and smooth the top. Bake for 25-28 minutes. Cool completely on a rack before cutting.